*This post has been sponsored by Brita® and Glad®. All thoughts and opinions are my own. Anyone who has healthy habits can tell you that eating healthy and living a healthy lifestyle doesn’t always come cheap. It can get very expensive, so how do you live a healthy lifestyle while on a budget? I’ve got 7 easy, actionable tips to give you so you can live a healthy lifestyle while on a budget. The best part? You can get most of these supplies at Dollar General, as well as fresh ingredients at your local farmers market or grocery store! No matter what your budget is, you should absolutely be including healthy habits in your day to day life. Just because you are on a budget doesn’t mean that you should reach for convenience foods loaded with preservatives. In fact, often times these convenience foods really aren’t any cheaper than healthy alternatives. I’ll show you how to incorporate healthy habits into your budget, no matter how much your grocery budget is! 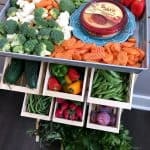 As a family of six, I have learned some crafty ways to incorporate healthy habits into our lifestyle without spending an arm and a leg at the store. We live in a rural area and that can mean access to a variety of options is often limited. For this post, I headed to Dollar General to see what healthy habits and ideas I could find on a budget. Since most areas have a Dollar General store I knew this would be a valuable resource for you. I found a plethora of healthy living options and they didn’t break the bank. I’ll show you all the secret finds that you can pick up at your local Dollar General in order to start implementing the healthy habits I’ll share in this post! There are a few healthy habits that I have found to be really helpful and attainable over the years. As a busy mom to four kids, I don’t always have time to do ALL of the healthy living things I’d like to, but these habits actually make life LESS hectic and more enjoyable! #1 – Cut all sugary drinks from your diet and instead, use a Brita® Filter Pitcher to save money. 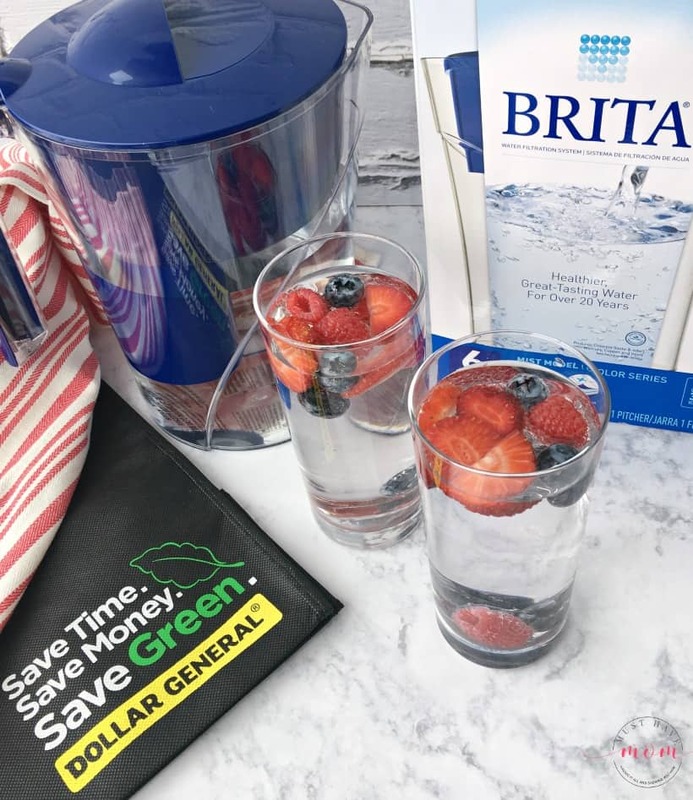 By using the Brita® Filter Pitcher over and over again you’ll eliminate the need for bottled beverages and save money. 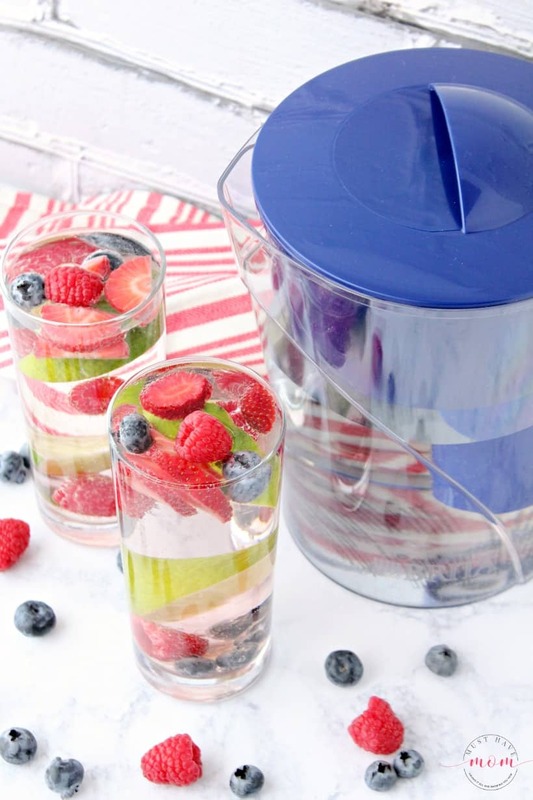 Add fresh or frozen fruit to your filtered water to flavor your drink without any sugar added! 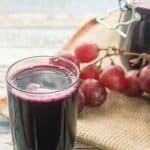 This is a great way to satisfy your craving for a sweet drink, without the unhealthy ingredients. Let the fruit sit for awhile in the water so the flavor infuses. If you want to speed it up, just use a utensil to mash the fruit which will release the flavors faster. 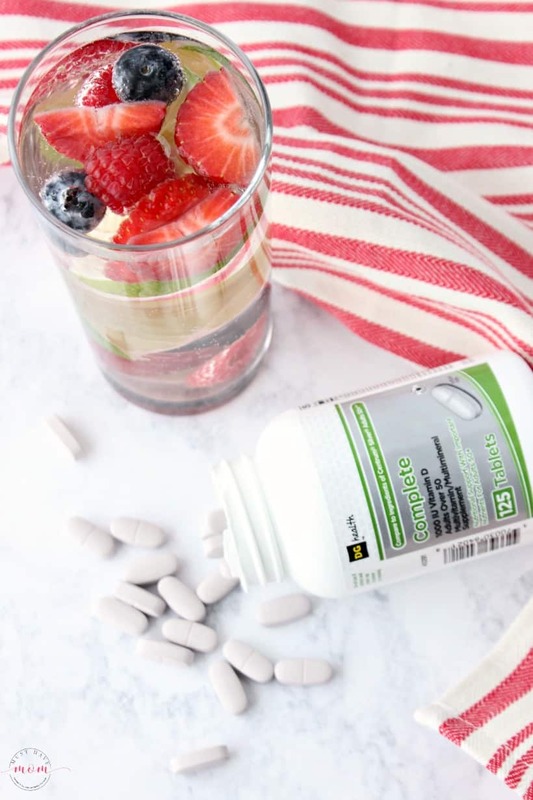 #2 – Buy inexpensive, store-brand supplements at Dollar General. They aren’t any different than name-brand supplements and can be a great addition to your daily healthy habits. Here in Minnesota, we have a big lack of sunshine in the winter so taking Vitamin D is a must for me! Check with your doctor to see what supplements you would benefit from. 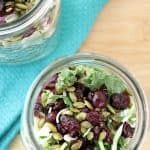 #3 – Prep easy, make-ahead breakfast recipes for grab and go convenience without the unhealthy ingredients! 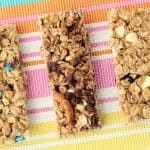 These 4 ingredient energy bites are quick and easy to make ahead of time and you can grab them on your way out the door in the morning. It’s convenience food at a lower cost than store-bought options which are often loaded with chemicals and preservatives. 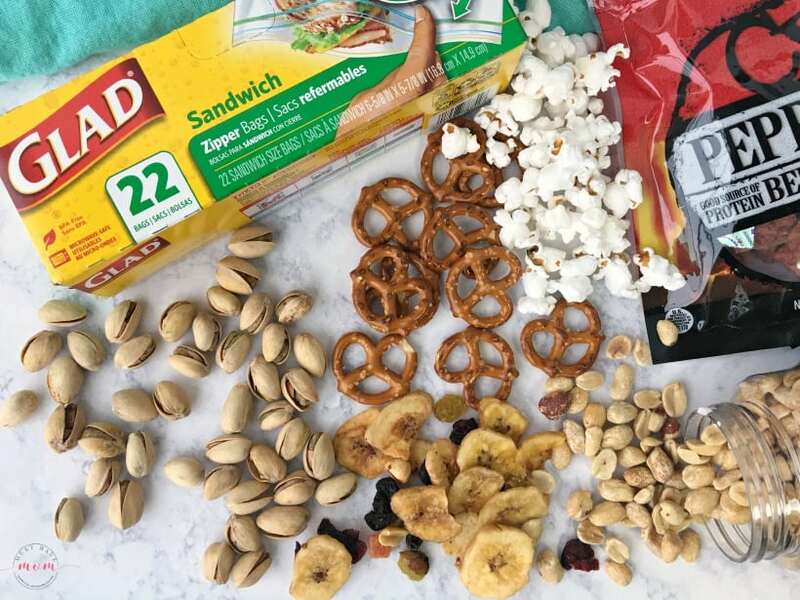 You will find all of the ingredients for these energy bites at Dollar General, including the natural peanut butter, chocolate chips, oats and agave. Grab the energy bites recipe HERE. You’ll also want to pick up a pack of the Glad® large square containers which are in the sandwich bag aisle at Dollar General. Store your energy bites in the Glad® container in the fridge. They last all week so you may want to make a double batch! 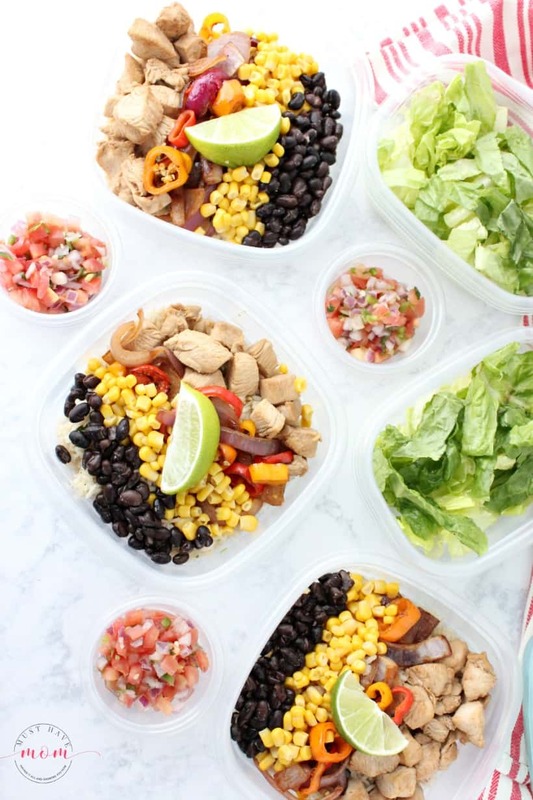 #4 – Prep make-ahead lunches for the week on Sunday night. One of my biggest tips for saving time, money and eating healthy is to plan ahead. If you have healthy options ready to grab and go out the door with then you are more likely to make healthy choices instead of convenient choices. 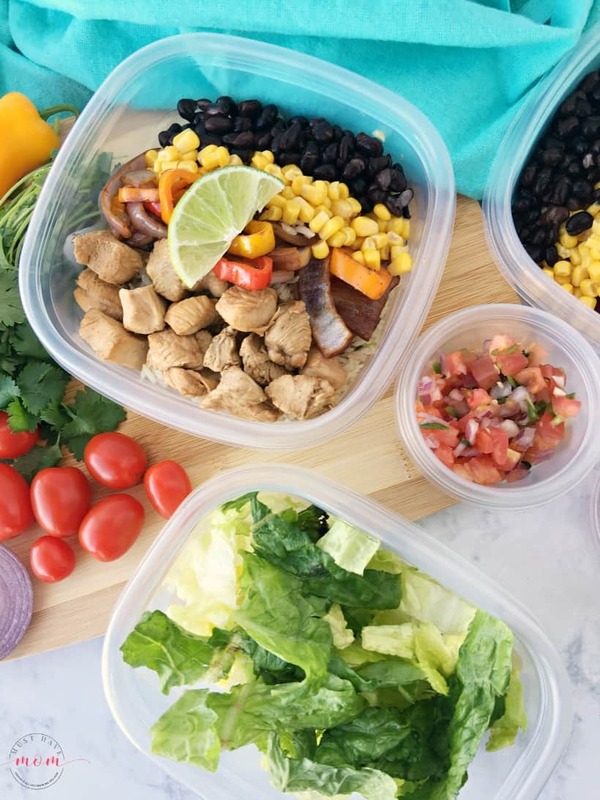 Pass up the temptation to grab a slice of pizza at your favorite spot, and instead, make these delicious make-ahead burrito bowls. They’ll remind you of your favorite chain restaurant, but without the price tag! The Glad® Lunch Variety Pack I found in the sandwich bag aisle at Dollar General is perfect for portioning out pre-made meals for the week. 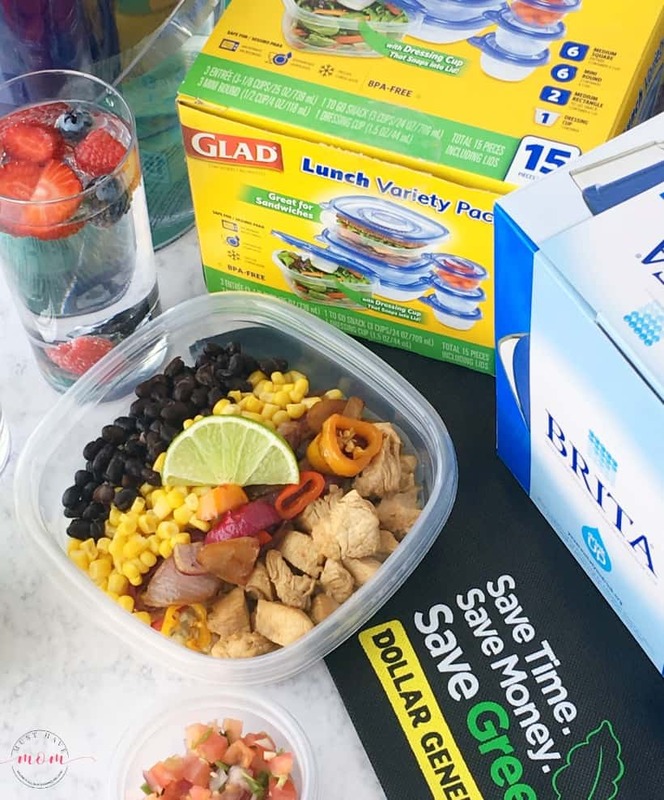 Grab one or two of the Glad® Lunch Variety Packs for your meal prep. You can get the healthy burrito bowls recipe here. For this recipe you’ll need some fresh ingredients, however, you will find the frozen chicken breasts, canned black beans and canned corn at Dollar General for a budget-friendly price! #5 – Make your own healthy snack packs. It’s more expensive to buy snacks in individual sizes, so save money by buying a large package and portioning them out yourself. 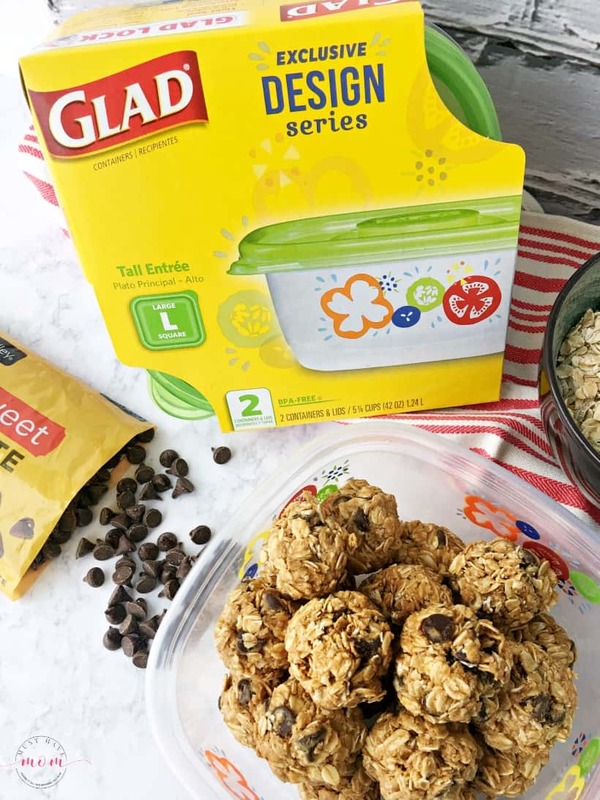 Grab a box of Glad® sandwich bags and some of the healthy snacks I found at Dollar General for a great price. Portion out the snacks into individual servings. I then added them to my snack station for easy grab and go snacking. It’s so much easier to choose a healthy snack when they are staring me in the face and I’m less tempted to grab a bag of potato chips instead! 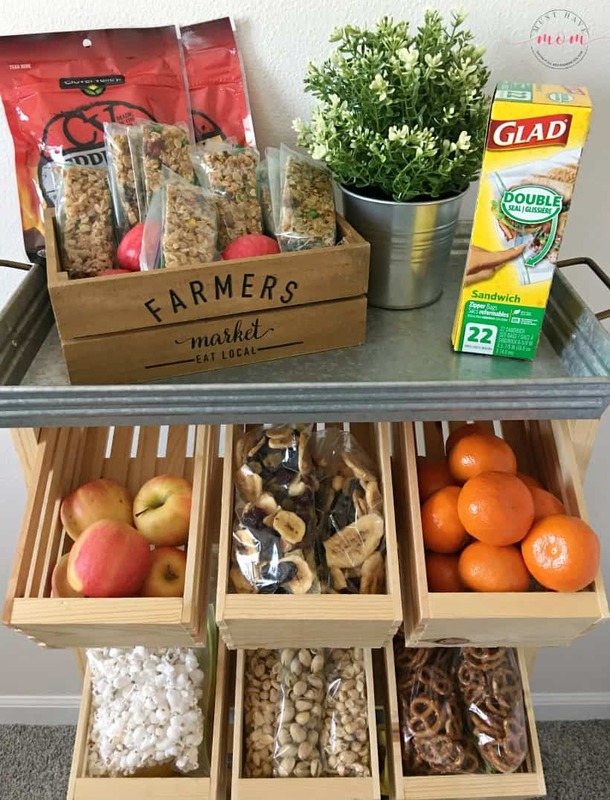 (Make your own DIY snack station with these directions) I also added my homemade granola bars to my snack station. #6 – Get plenty of rest. This healthy habit is also a free habit! It’s easier said than done (there are never enough hours in the day), but there is plenty of research to show just how important sleep is to our overall health. Getting plenty of rest is imperative to leading a healthy lifestyle. Start saying “no” – Don’t over-commit yourself when you really don’t have the time to add another project or responsibility to your plate. Get a planner (they have some at Dollar General) and get organized. Having all of my plans and obligations written on paper is a huge help to me and helps me feel more centered and organized. Finish one thing before starting another. I am notorious for having half-completed projects all over the place and it leaves my brain feeling just as scrambled. Finish one thing before moving on to the next thing and it gives an overall sense of calm. Enlist some help! You don’t have to do it alone. Enlist the help of your family and friends when you need it. By including these 7 healthy habits into your daily life you’ll find you lead a healthier, more productive life. As you can see, it doesn’t have to cost an arm and a leg to eat healthy and live healthy. It just takes some planning ahead and being intentional about including healthy habits in your day to day life. You can find all of these products at Dollar General and be sure to sign up for their digital coupons to save even more money! These are all great tips. I especially love the last one! I enjoy shopping at Dollar General. These all look so good! I can’t wait for fresh berries from the garden for homemade healthy drinks. These are all great ideas. 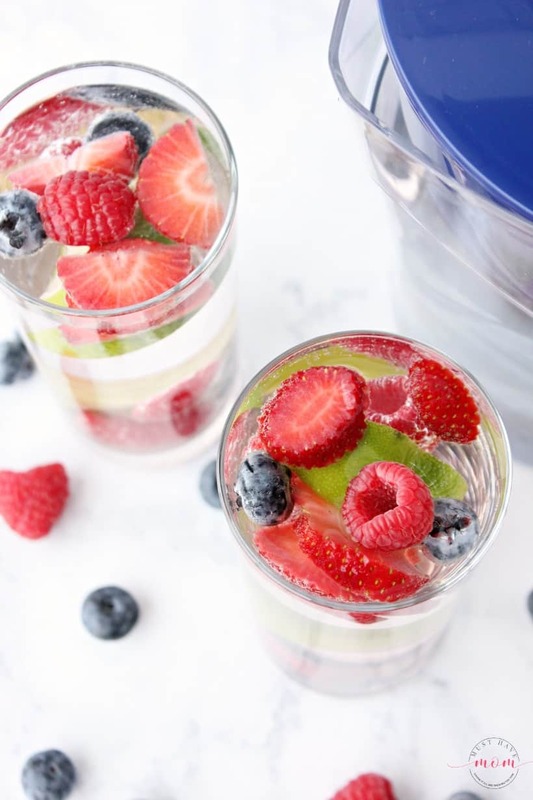 I have a brita filter and I do make fruit infused waters all the time – they are SO good. Fruit infused water is my favorite too! I just bought a Brita and honestly, it’s been such a great way to enjoy water! These are such wonderful ideas! Great tips! I go to our Dollar General fairly often. Those burrito bowls look amazing, by the way! YUM! All of these are great! They’re also why I love Dollar General. I can get everything I need, and I pay so much less. It’s awesome. These are all great tips and I’m definitely going to use a lot of them. I know meal planning saves a lot of money! I can also make them wish healthier and I can make a bunch more for a lot less money. I love my Brita Water Filter Pitcher too! It is so convenient to always have fresh water on demand. These are all great ideas and add to our healthy lifestyle choices. It is so smart to make all those grab and go choices for convenience, savings and health. I love these tips! Cutting sugar has been a big one in my life and the thing that’s honestly made the biggest difference in my every day (that and carbs, too)! These are such great ideas. I make infused water all the time! Can’t wait to check into getting a Brita filter! I really need to cut out sugary, carbonated drinks and that water looks like a great substitute. The Brita makes it easy to have a healthy and refreshing beverage. Great post! I want some of that fruit infused water! Yum! Thank you for sharing on Merry Monday! Hope to see ya next week! I need to get a Brita water filter pitcher. These are all great ideas for living healthy. Stopping by from the #HomeMattersParty link up. Thanks for partying with us!